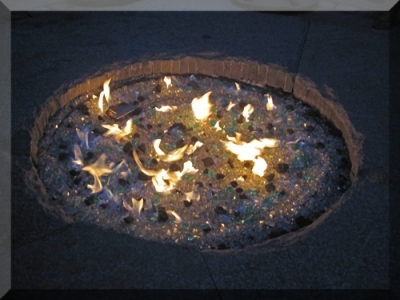 Convert an old fire pit into a modern glass and fire pit. 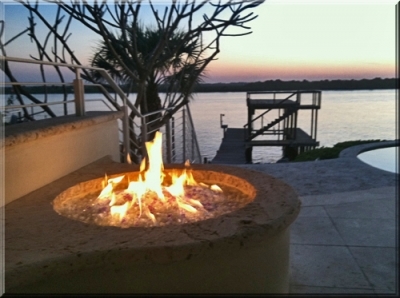 Custom pool side fire pits. 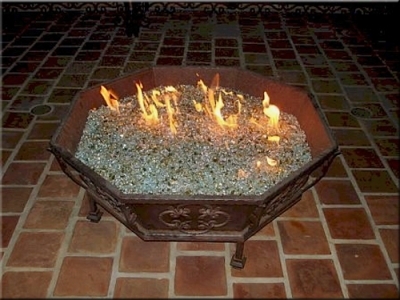 Juan utilized one of our 18" RV Fire Pits with a 36" Black hose (with regulator), for his propane fire table. 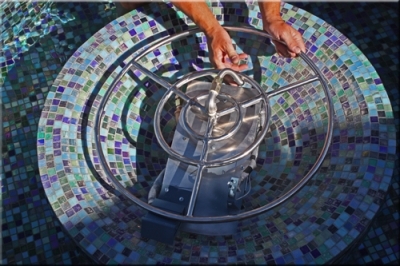 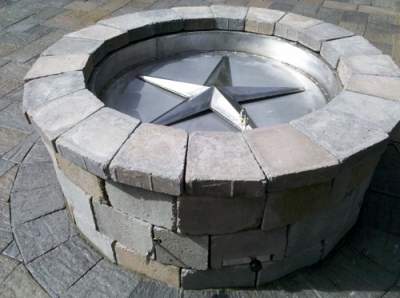 And even though the RV fire pit is a square shape, the burner used is circular; making it acceptable to use in Juan's circular fire area opening. 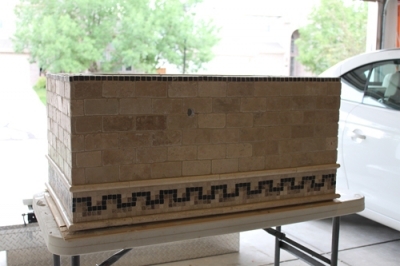 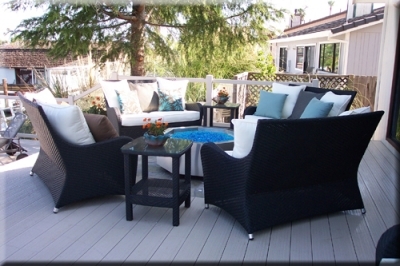 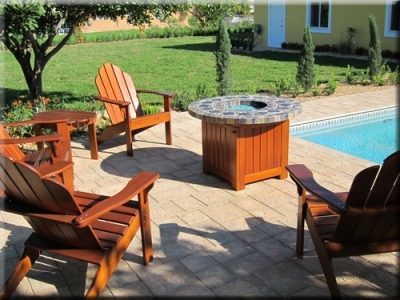 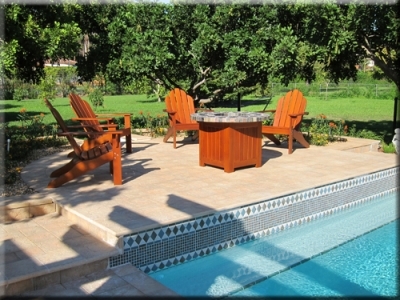 The table was constructed out of Cypress wood, topped with Mosaic slate tile. 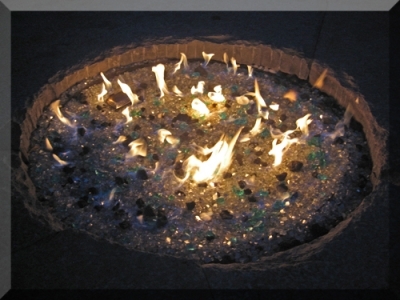 And the FireGlass used was 1/4" Solex Bas eGlass, 1/4" Azurlite Base Glass with a filler base of Pea Gravel. 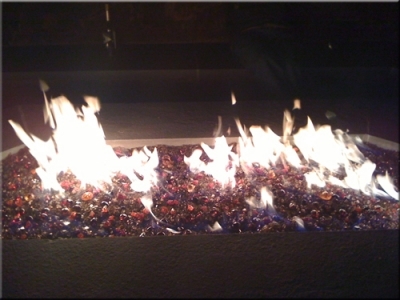 "Attached are some photos if the fire table I built with your help. 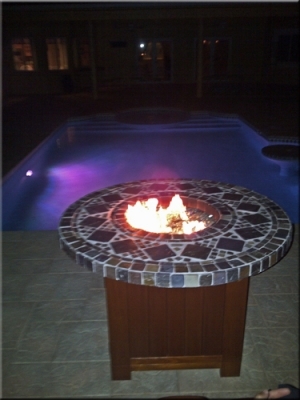 It is made of cypress wood and topped with Mosaic slate tile top I made. 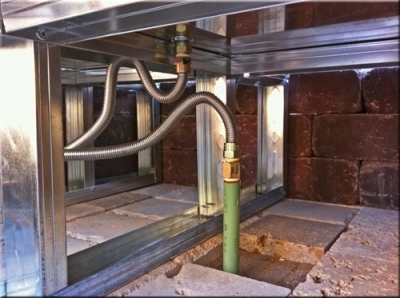 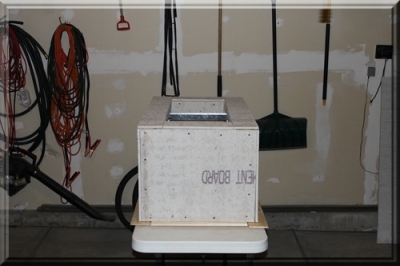 The heating unit is one of your portable RV untits!" 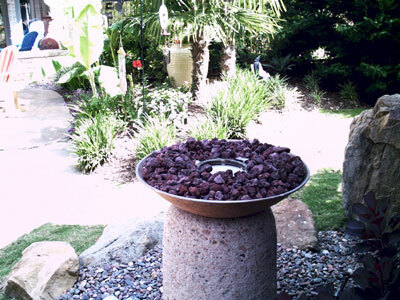 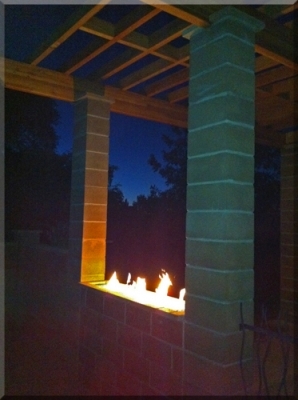 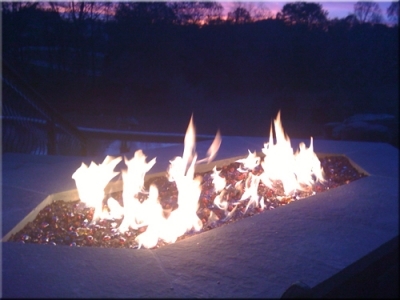 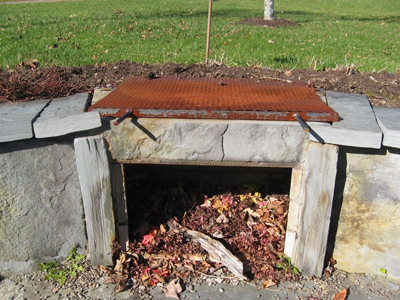 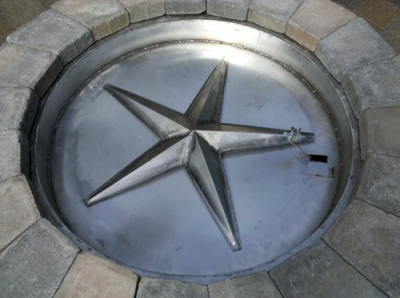 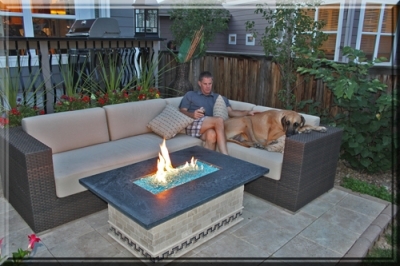 These are some great photos of a home-made Propane fire pit. 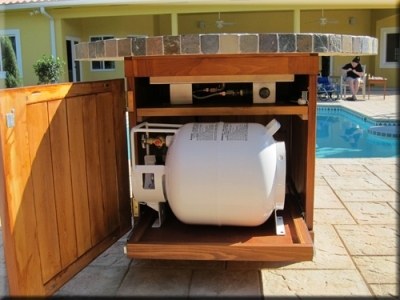 What's unusual about this propane pit is that instead of a tank the propane feed is hard lined in. 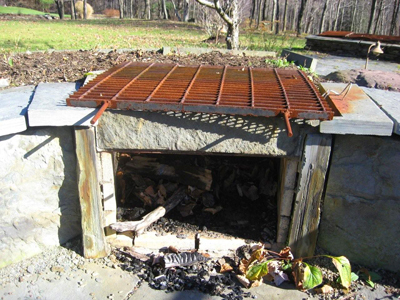 Our client Brian Jensen was rather handy so he built his own metal frame and we provided the stainless steel burner ring, propane system, control valve and Azurlite Base Glass. 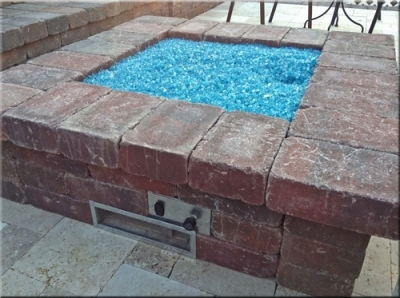 Sammy Vaughn from Florida sent us a few photos of his outdoor fire pit with some of our 3/8" Starfire Base Glass and Hyacinth Topper. 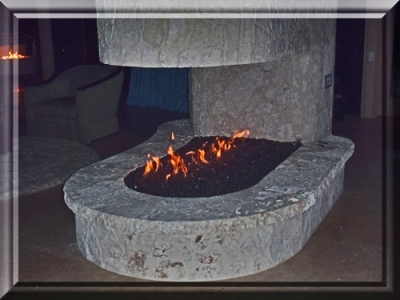 Here are a few other pictures from Sammy's fireplace, this time with some Bronze Base Glass and Bronze Reflective Base Glass. 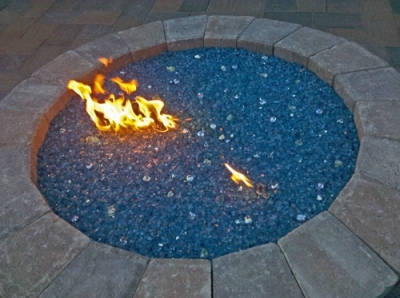 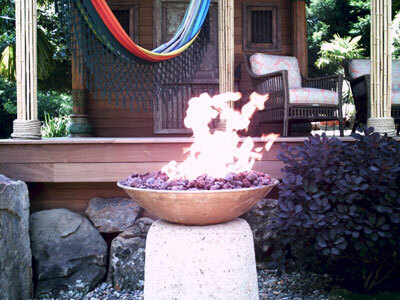 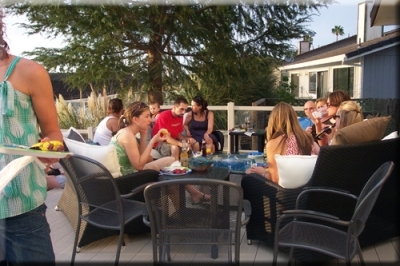 A Modern Outdoor Fire Pit. 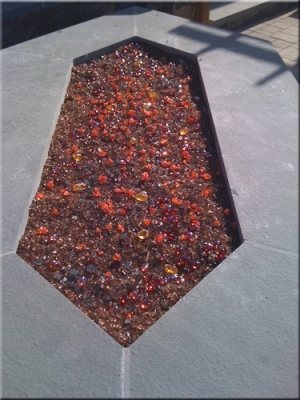 The fire pit below has Clear Base Glass, Starfire Base Glass, Amber Topping, Amber Topper and Dark Red Orange Topper. 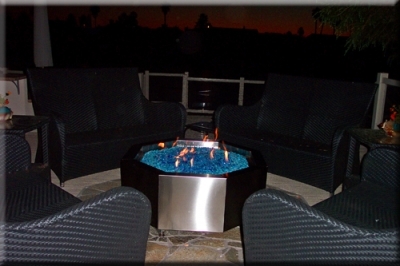 The fire pit above and below have Gray Base Glass, Gray Reflective Base Glass, Ice Ice Ice Topper and Red R Topper. 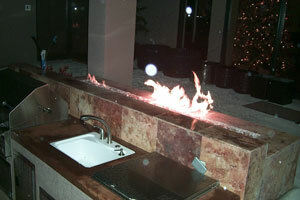 Our propane burners were set to 100,000 btu's each for maximum heat. 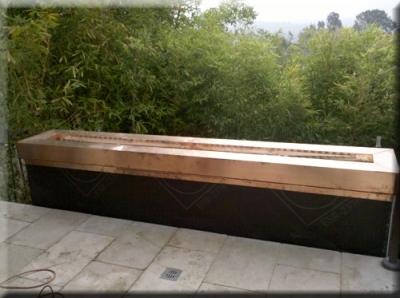 The glass that we used was Bronze Rust Copper Base Glass. 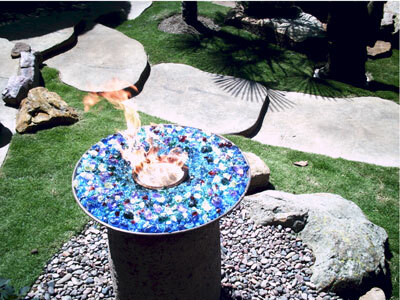 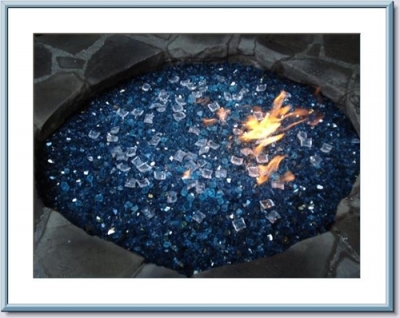 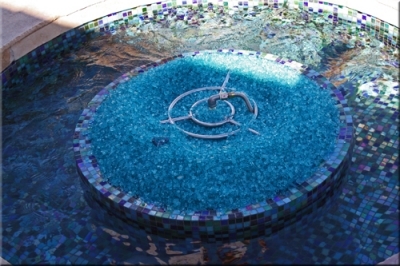 The next fire pit is from Sandee Visintin and the glass that was used was, V Blue Base Glass, V Blue Reflective Base Glass, Aquamarine Blue Topper, Turquoise Blue Topper. 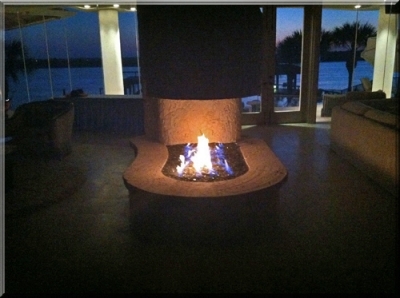 In a stainless steel octagonal fire pit at the beach. 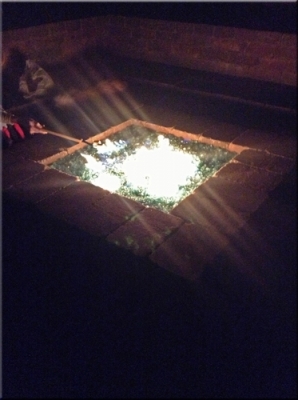 If you take note a 1/2" piece of glass was placed on top of the fire pit for day time use. 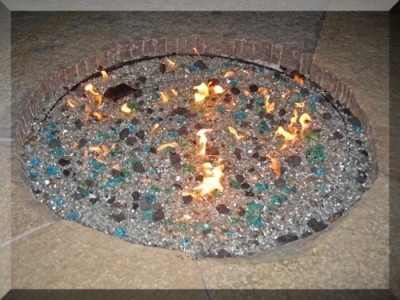 The fire pit below has Azurlite Base Glass FireGlass/ Fire Glass installed. 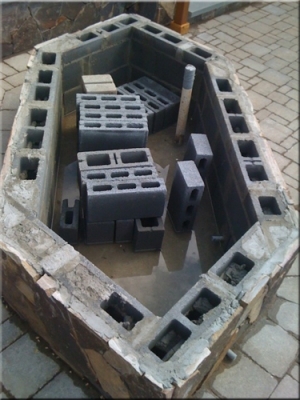 This fire pit was to have an electronic ignition but the pool builder forgot to wire it, oops! 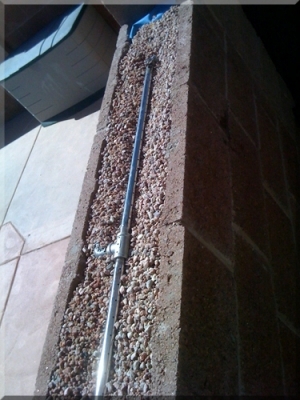 We then installed a battery operated IPI system and we will explain as we move on. 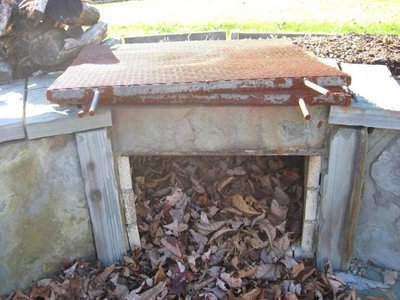 The first issue was we were told the pit was 8" deep, it was only 6" deep! 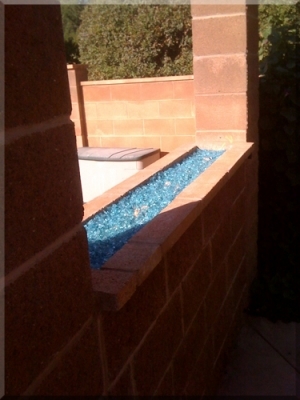 That will explain why the glass is mounded so high. 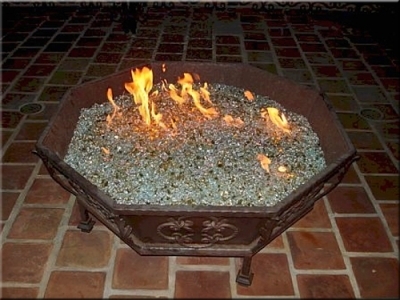 they put a board on top of the fire pit and measured it to the top not the bottom. 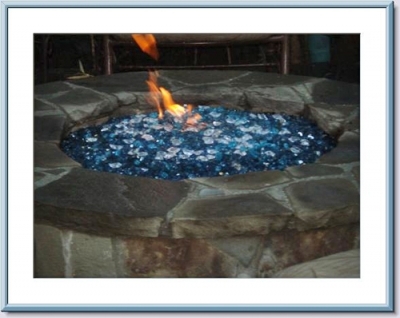 On the bottom front left of the pictures you can see the blue battery compartment. 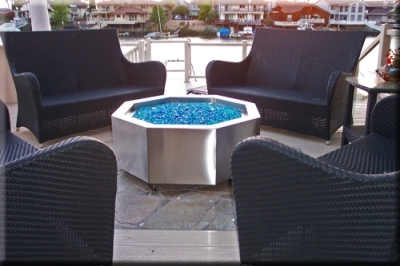 This will be just slightly covered with glass but easy to find come the time to replace the batteries. 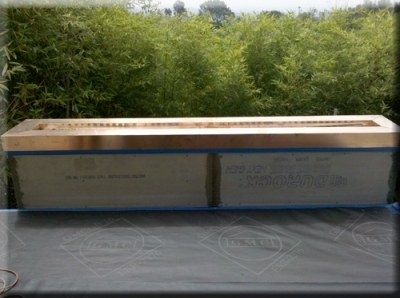 First layer of glass going on. 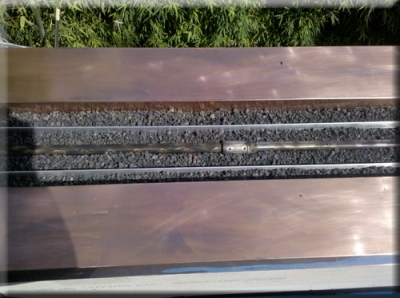 Below you can see that the ignition is just above the surface and the battery box is now gone! 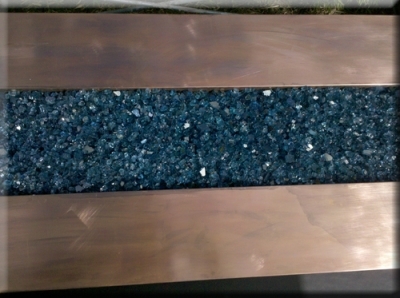 Below here it is finished. 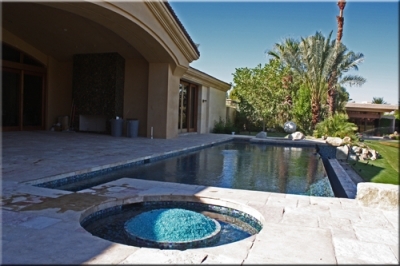 Yes it is on the golf course in Palm Desert. 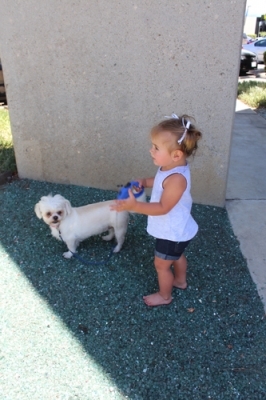 Below we did a Paparazzi photo shoot! 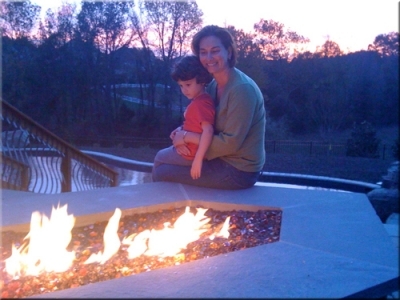 This home took 2 years to build! 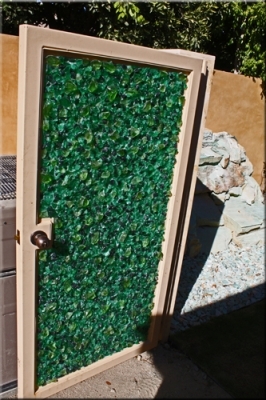 The gates below had Sea Glass laminated to the glass panels. 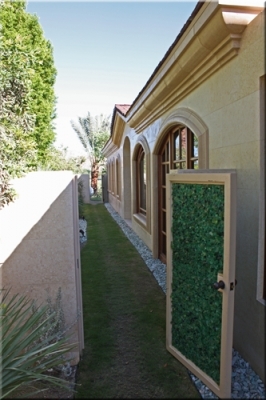 If you take notice to the outside walls, the entire house was covered in marble! 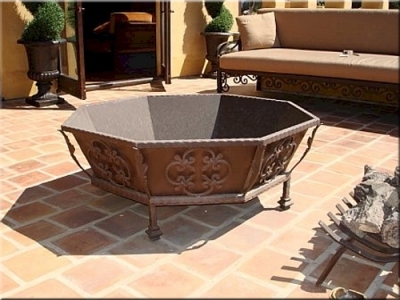 Crown moldings included! 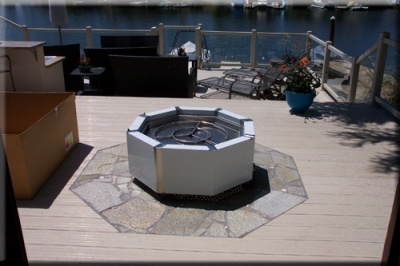 This unique fire pit and FireGlass design was sent to us from our customer Edward Steinfeldt, who used a 24" Stainless Steel Double burner, 1/4" Clear Base glass, 3/16" Gray Light Base Glass with several various Toppers. 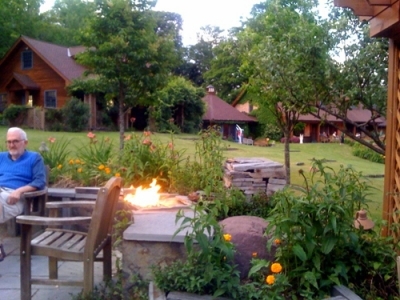 The fire pit below is from Scott Woods. 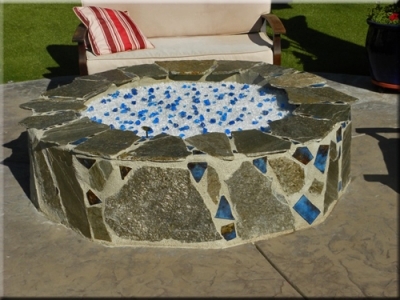 He installed a Starfire Base Glass and Topped it with Copper Blue Topper and Cobalt Blue Topper. 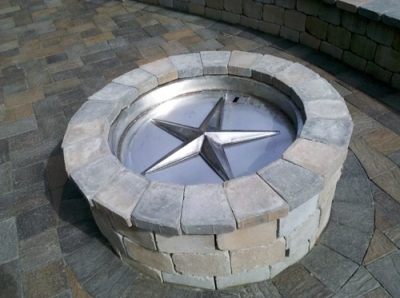 The next fire pit below has one of our FPPK's installed. 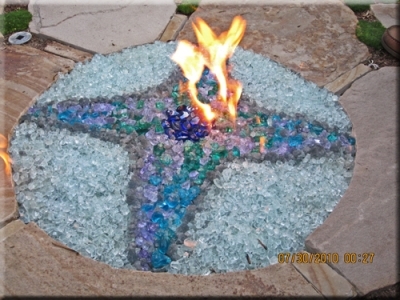 We didn't supply the star burner burner we did get it to burn correctly with a Ford Blue Base Glass. 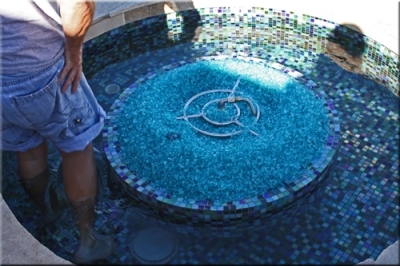 Then it was Topped with Clear Diamonds and Blue Diamonds. 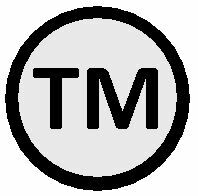 We will explain as we move on. 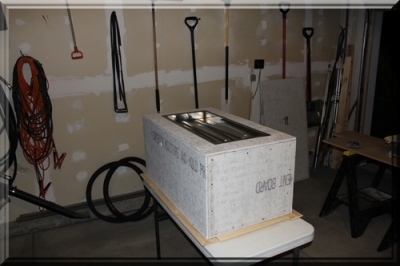 Below you can see the gas shut off on the left and our FPPK box on the lower right. 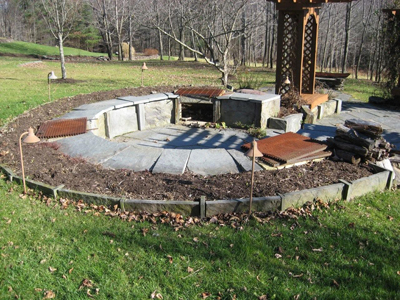 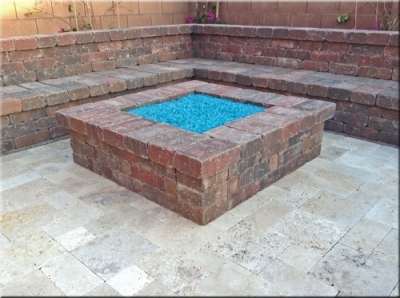 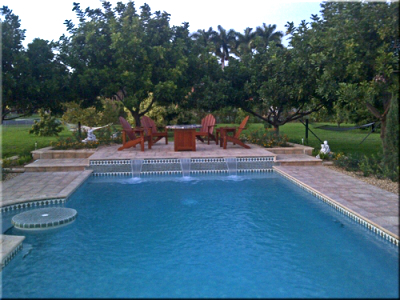 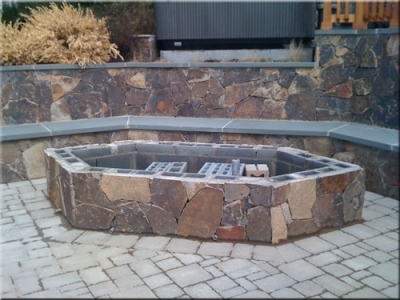 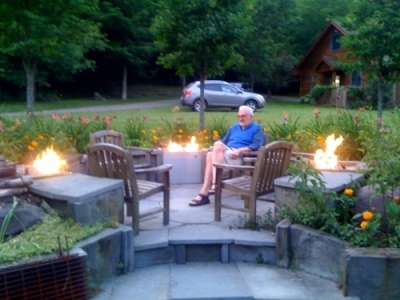 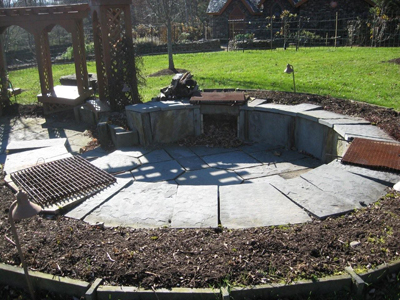 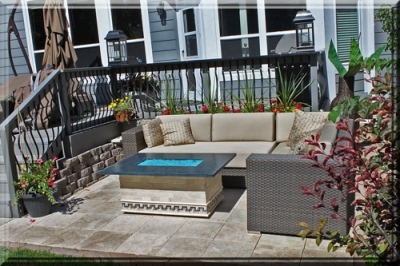 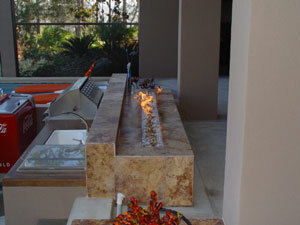 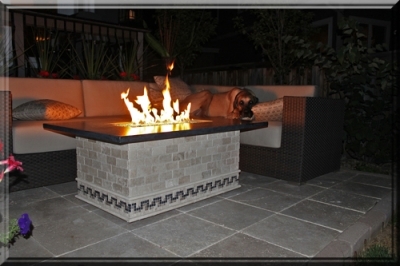 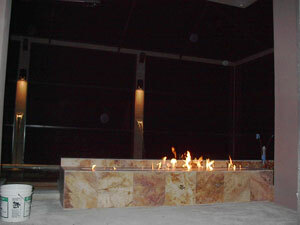 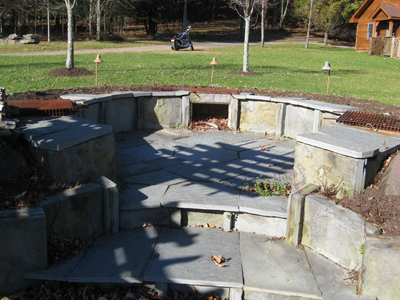 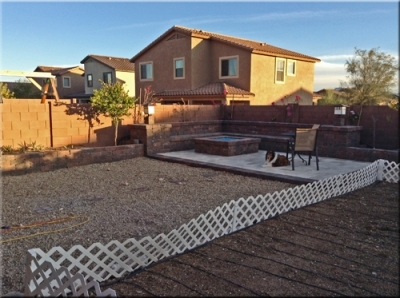 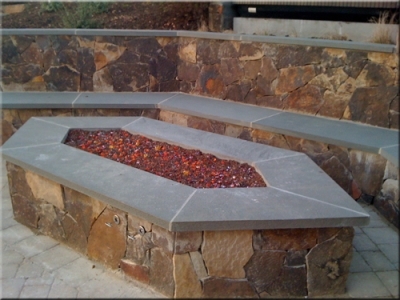 The next propane fire pit below was built and installed by Kevin Smith. 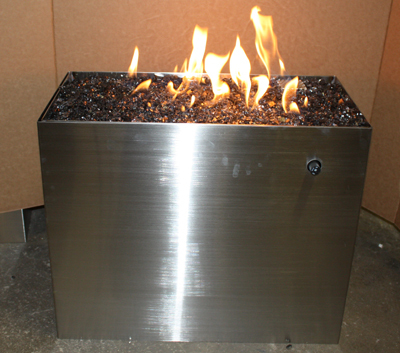 He used an outdoor stainless steel burner that was calibrated to insure a clean burn. 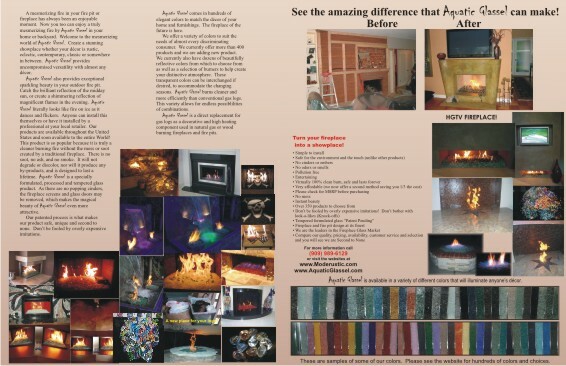 Beware of companies out there who sell propane burners, but no nothing about how to safely and cleanly burn glass. 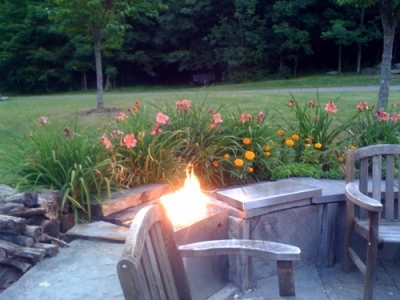 Because when you have any issues, and you will have issues, you'll find that they just seem to never call you back. 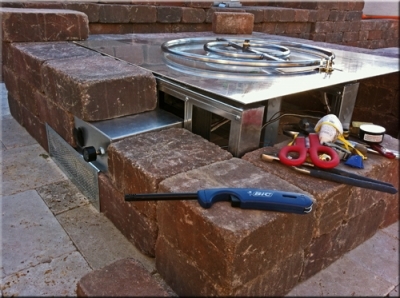 Below you see the stainless steel burners on a bed of crushed pea gravel inside a hollow cinder block; which serves as a pan for the propane burner. 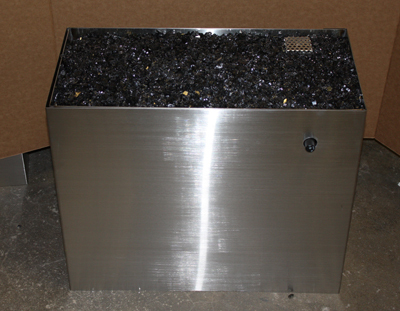 Below you can see the Copreci and air mixer mounted to a bracket on the end of the pit. 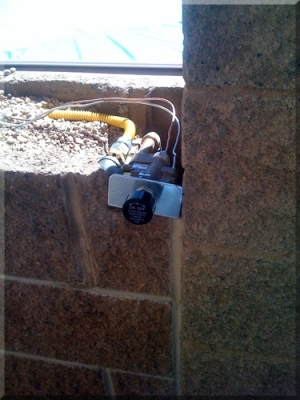 Remember, the Propane air mixer needs a great deal of care. 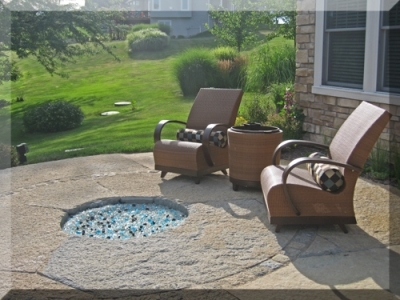 The fire pit below is a propane fire pit. 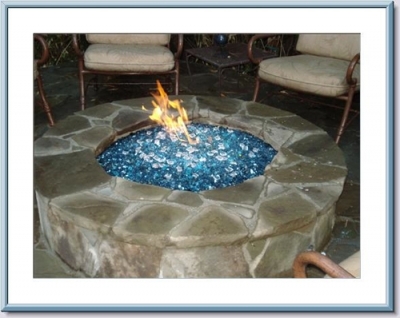 Notice that there is no soot! 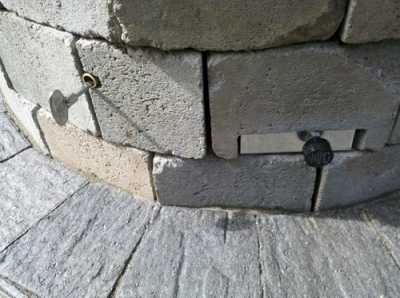 If you do it right, then it is done right! 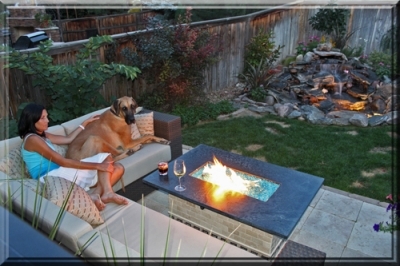 We are very proud of this fact. 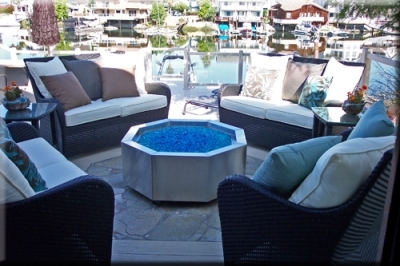 The base glass is a Starfire Base Glass topped with a Copper Blue Topper. 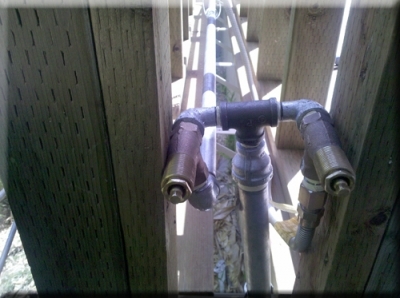 On the picture below you can see the Propane pilot cover/ blow out box at the bottom of the picture. 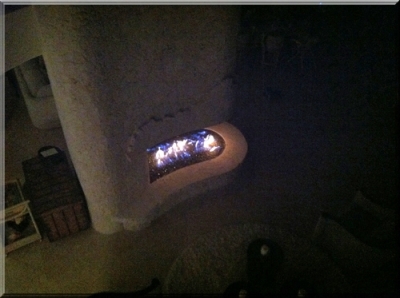 When I received these pictures I didn't understand the dark chunks???? 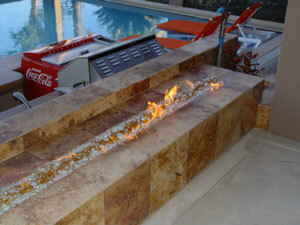 The customer was being creative and dropped in a few chunks of lava. 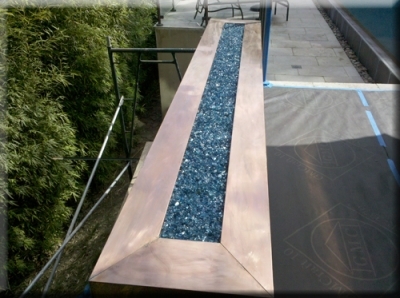 This particular Topper is a Copper Blue Topper, meaning we use copper and chrome to manufacture the glass. 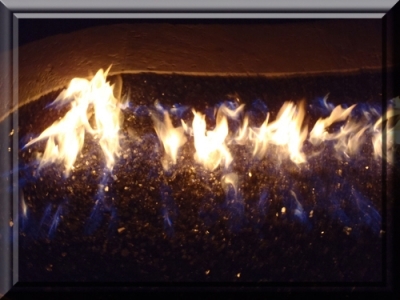 What this means is that when the glass gets hot, it turns green (because of the copper) and when it cools it returns to blue (because of the chrome). 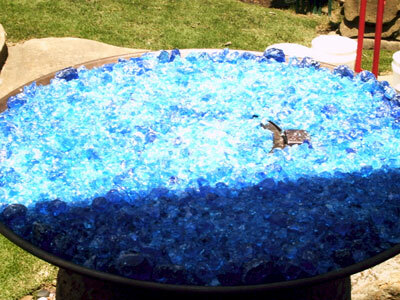 We actually have almost 30 colors which change colors. 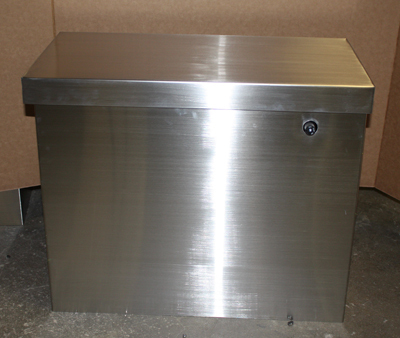 We hope to introduce these chameleons in the near future. 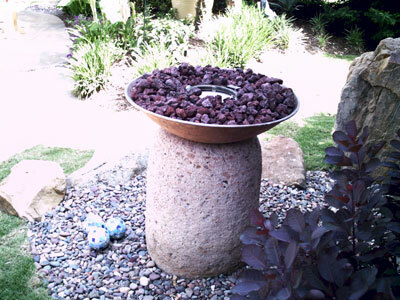 But for now they are just hiding amongst the other colors. 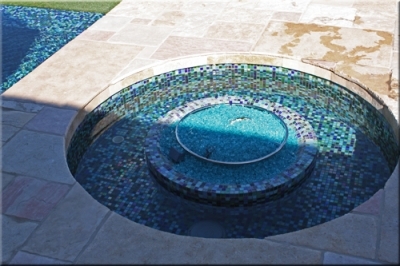 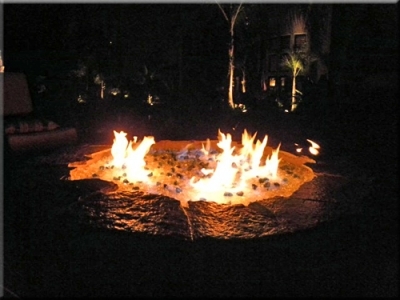 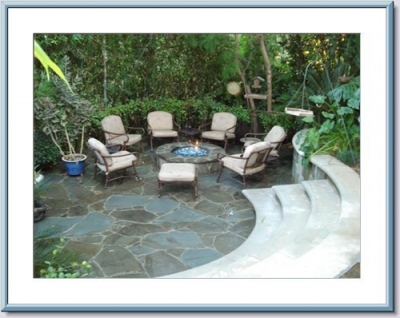 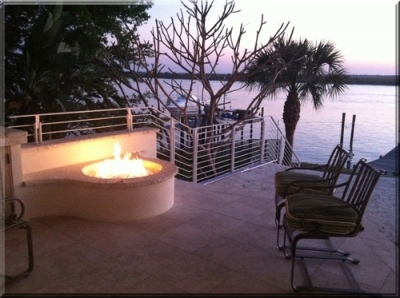 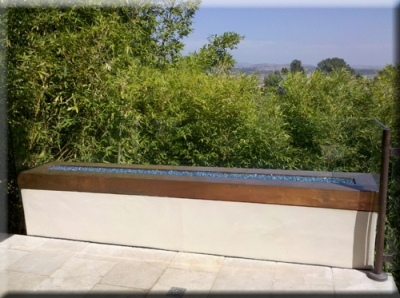 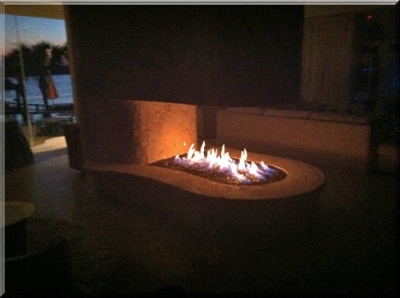 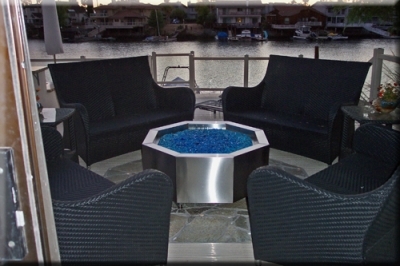 The fire pit below was designed by Tim Warden of Orange County, California. 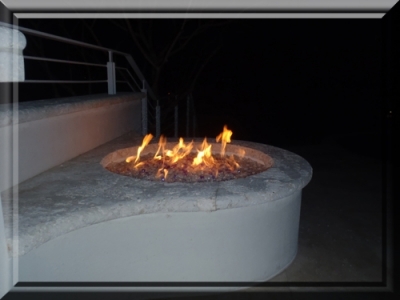 We helped finish the design/ build of this fire pit. 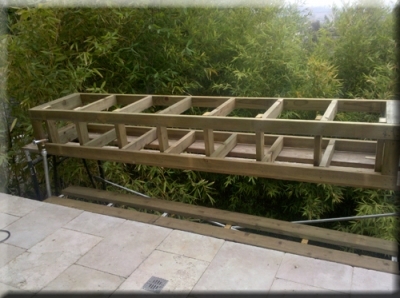 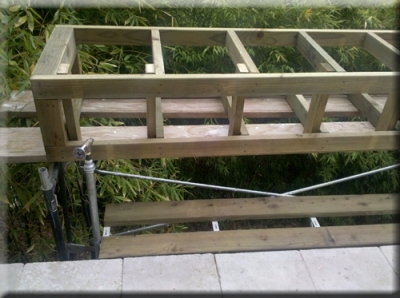 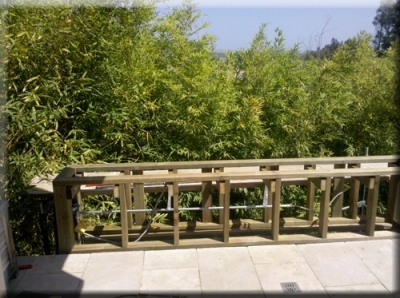 Start with a cantilever design off of the deck overhanging the hill side. 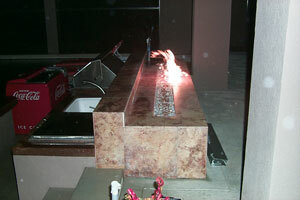 We used two 50" "T" burners in #304 Stainless Steel. 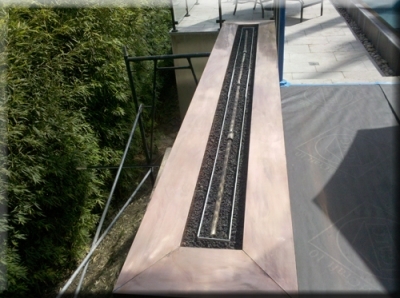 Copper cladding was added to the top portion and wrapped in water proofing material. 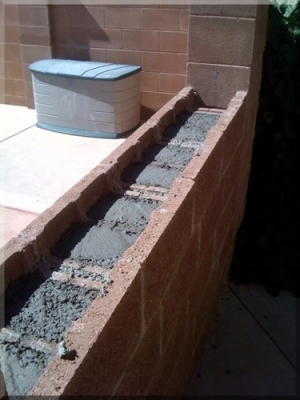 Durock (cement board) was added the the lower portion for an application of smooth stucco. 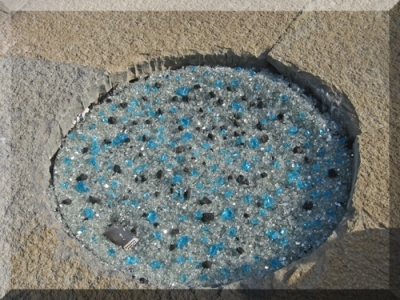 Ford Blue Base Glass was added with Ford Blue Reflective Base Glass. 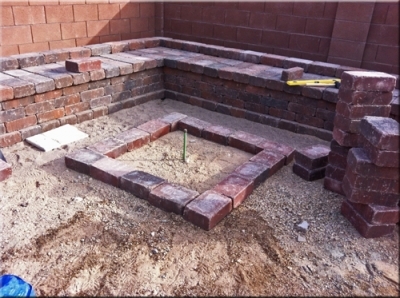 Starting to look nice! 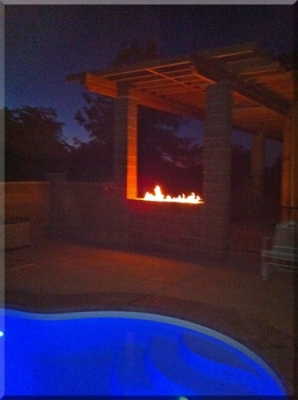 Real Nice! 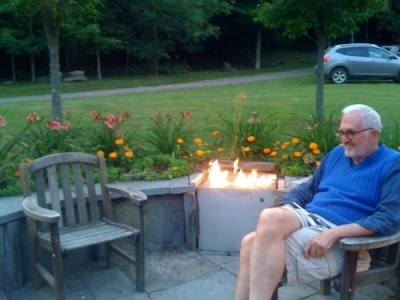 No that's not Marijuana in the back ground! 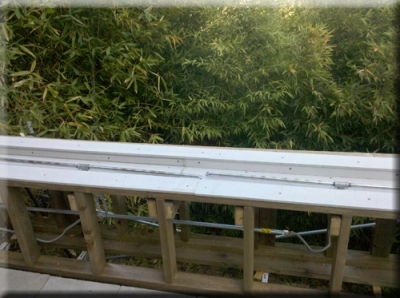 The 1/2" glass panels get installed with stand off clips on the back side so you don't see the installation. 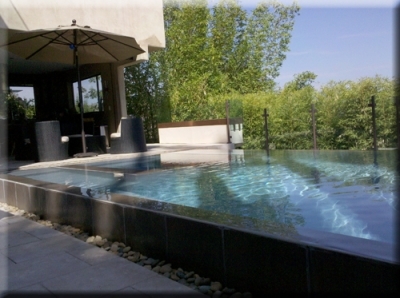 Looking from across the pool, very cool! 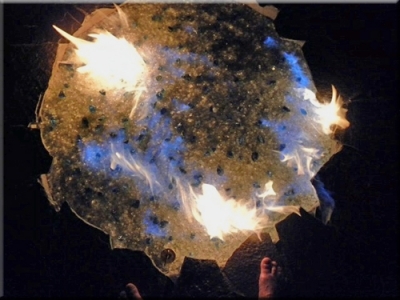 This is how it started. 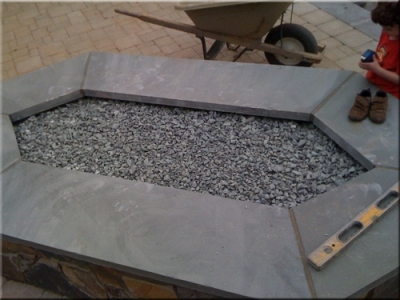 Pea gravel base. 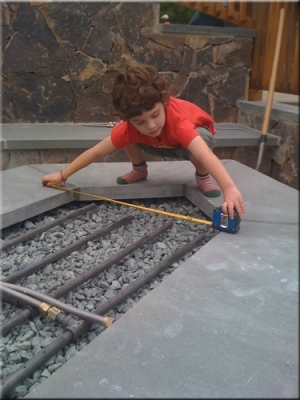 Measure once, cut twice. 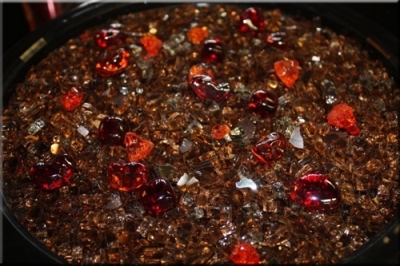 Ohhh, what color?? 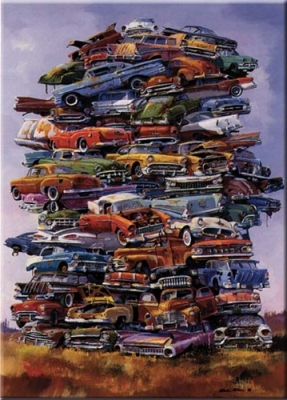 There are sooo many. 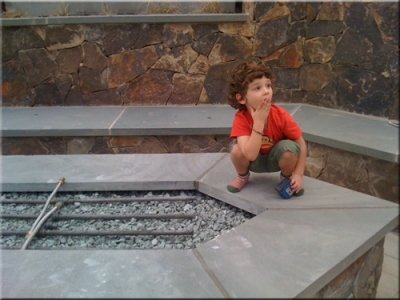 What to do? 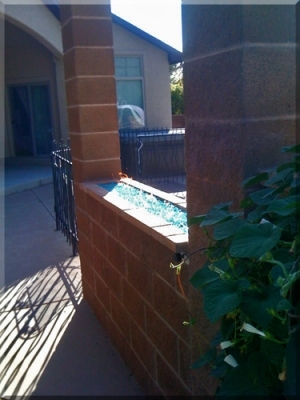 Clear Base Glass and Gold Bas Glass on top. 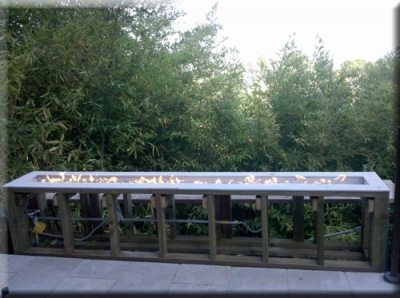 You can see the logs just outside of the pan on the left, yuk! 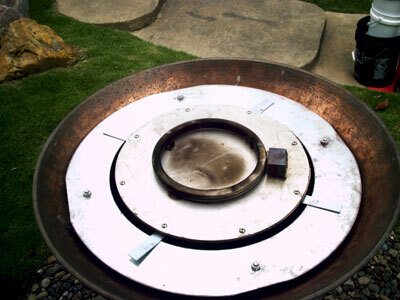 I personally would of installed a ring burner, but that is just me! 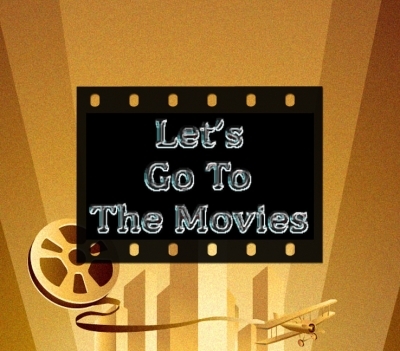 But you have to admit, it is a good idea! 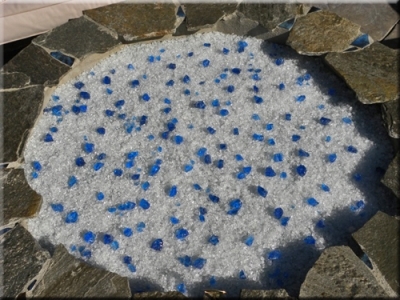 Ford Blue Base Glass, Ford Blue Reflective Base Glass, A few pounds of 1/2" Azurlite Base Glass and Topped it with Ice Ice Ice Topper.